I'm Alfie, the head elf here at Santa's Magical Kingdom. Santa asked me to describe a few of our scenes for you. I'll try...but every elf knows you need to experience the Kingdom to fully appreciate its magic! 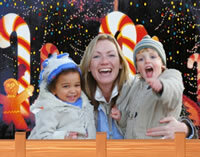 Want to know how Santa's Magical Kingdom began? Click here to read a magical poem that tells the whole story! As you drive through the four story tall Kingdom doors, you'll discover a wacky, whimsical, wondrous world that's guaranteed to make you laugh. It's an extraordinary place where pigs fly and ice cream sundaes are as big as a boat. Millions of lights dazzle so brilliantly you can see them for miles. Trees twinkle, fountains glisten, and a shimmering 300' waterfall flows from the sky. Everywhere you look, there's something more spectacular to see than the moment before. And, to give families the opportunity to discuss the true meaning of the season, we've included a depiction of The Blessed Nativity. Along the way, you'll encounter Elfland, our very own village in the trees where we live, work, and play. Sometimes a lucky elf catches a ride on a friendly butterfly as Santa's flying reindeer soar overhead. You'll get a chuckle when you watch the acrobatic elf who tries to swing across the road on a rope but ends up in a comical mishap. 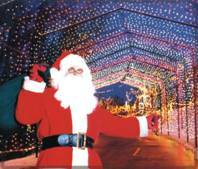 The Tunnel of Dancing Lights is back by popular demand. It's as long as a football field and features state of the art lighting animation. (along with a touch of Elfin magic) The special effects are so spectacular they will take your breath away! Dolphins splash in a river of lights as they frolic alongside your car; and if you look carefully, you'll see angels learning how to fly as you pass by their flight training school. 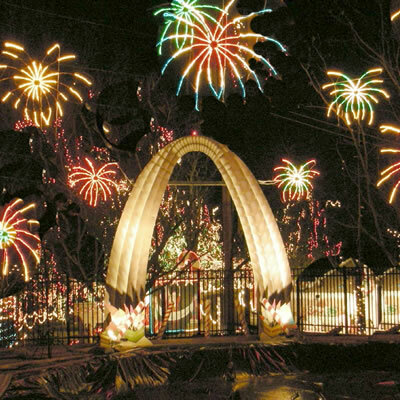 Santa's Magical Kingdom even has its own version of the famous St. Louis Gateway Arch complete with a dazzling explosion of "fireworks" that light up the sky. Ever wonder where elves go for a sweet treat? Candyland of course! Here you'll find a scrumptious life sized gingerbread house dripping with icing and candy. On the other side of town, in Candy Cane Village,you'll learn the secret of how candy canes get their stripes at the Herb B. Elf Factory. Everyone knows that elves love to build toys for good girls and boys, but this year we got carried away and Toy Land is overflowing with GIGANTIC 3-D toys and fun special effects. Santa's sleigh is fully loaded and ready for take-off.It's every child's dream come true! Hey kids, don't forget to bring your letters to Santa to drop off in his mailbox as you drive by the North Pole.There's no need to worry about the polar bears and penguins - they're very friendly! And did you hear the news? Santa's Workshop is now located inside Kringle's General Store where you can shop for unusual treasures and visit with Santa every night! Click here to learn more. 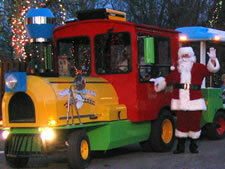 Treat your family to an unforgettable holiday adventure when you book a ride aboard the Santa Express Train or take a charming Old Fashioned Holiday Wagon Ride through 35 acres of pure Christmas magic. Either way, your family will have a wonderful time together creating memories they'll talk about for years to come. Click here to learn more. Well folks, this is just a glimpse of some of the incredible sights that await your discovery here at our Kingdom.We invite you to join us this season to start a holiday family tradition of spending good times together where fond childhood memories and a little imagination can still exist in an enchanting fantasyland called...Santa's Magical Kingdom.